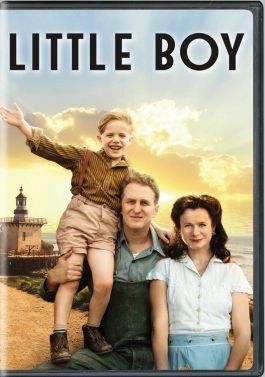 We received Little Boy from FishFlix.com to review. FishFlix.com is an online provider of Christian movies "to inspire and entertain." We were thoroughly pleased with the movie we received! We don't often watch "people" movies with the kids, as they are still young and prefer "cartoons," but my 4 and 5 year olds watched this with me. They were entertained by the movie and actually sat through most of it with me. They generally don't watch tv for more than 30 minutes at a time. But once they got into this movie, they sat down and watched the whole thing! Little Boy is a story about 8 year old Pepper Busbee, who lives in O'Hare, a small American town on the coast of California. He lives with his mother, father, and older brother during WWII in the 1940's. His brother tries to enlist in the war, but is turned away due to the fact that he has flat feet (it makes him clumsy). So his father takes his place and is sent to the Philippines, where he is taken as a prisoner of war. Meanwhile, Pepper is at home still upset that his father is gone. His father had instilled in him a deep faith in his ability to believe in himself. So despite his small stature (hence the nickname), he believes if he has enough faith he can bring his father back. He struggles, like most people at the time, not to be angry at the Japanese. There is a man in town who is from Japan that Pepper and his brother take their anger out on. At a sermon, the priest talks about faith can sometimes be enough to move a mountain. Having just been to a magic show where a magician showed Pepper how to move a bottle, Pepper took it upon himself to be faithful. The priest gave him an ancient list of good deeds to show his faith (such as visiting the sick, burying the dead, etc. ), and included on the list to befriend the Japanese man. Pepper is at first unwilling to do this final task, but he eventually becomes good friends with him. At one point an older boy teases Pepper about his size and his list to bring his father home and Pepper decides to show the world that he means business. So he focuses his might and attempts to move a mountain. And it moves, with the force of a earthquake. Many would believe it was a coincidence, but Pepper and many others, were convinced it was a sign of his faith. He then focuses his faith on the ocean, facing the direction his father is in, and is there for several days, until finally one morning he is greeted by the townspeople who tell him that the war is over, thanks to "Little Boy" the bomb. His father isn't immediately released from the prisoner camp though and it is attacked. His father is found dead and Pepper scratches off the last task on his list, Bury the Dead. His family is devastated, but they believe it is the will of God. The ending is wonderful though, so definitely watch it through to the end! My daughter really liked that the story was able a little boy named Pepper. It's a new name for her, and she really liked his character. She liked that he believed he had "powers" to move bottles, mountains and end the war to bring his father home. She knows about WWII and other than a few pages we read in a history book, this was the first real visual of the reality of life back then. It was great that the story was told from the perspective of a child, which they can relate to. Little Boy is really a magical, heartwarming story for the whole family. We really enjoyed it and would highly recommend it for other families. Even if you don't believe, you can still relate to the love a boy has for his father. And his daring journey of faith to bring him home from the war. If you want to read more reviews from the TOS Crew, click on the banner below!